Do I need to pay CA tax for exports outside the US? In California you would need to obtain a seller's permit. This requirement applies to individuals as well as corporations, partnerships, and limited liability companies. Both wholesalers and retailers must apply for a permit. Have an office, sales room, warehouse, or other place of business in this state (even if the location is only temporary). Have a sales representative, agent, or canvasser operating in this state. Receive rental payments from the lease of tangible personal property in this state. Your social security number (corporate officers excluded). A driver license number, state ID number, or other ID (e.g., passport, military ID). Incorporation date, corporate number, and FEIN number (corporations and LLCs only). The name and location of a bank where you have an account. Names and addresses of suppliers. Name of the person maintaining your account. Names and addresses of personal references. Anticipated average monthly sales and the amount of those sales which are taxable. If you do not have a social security number you may obtain an ITIN number from the IRS. If you are not eligible for an ITIN number you may have to fill out a different form than the usual W-7 to complete your registration. A seller’s permit is not the same a business license and you will need to contact the state, county and city you will be operating to make sure you are compliant with their requirements for your particular business. 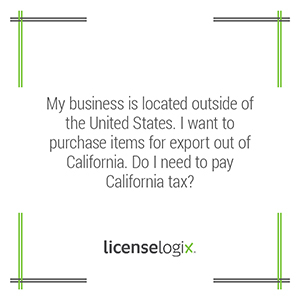 LicenseLogix handles licensing in all 50 states and can help you determine if you need a license in a particular state, county or city. When you decide to partner with LicenseLogix you are assigned an Account Manager to be your point of contact throughout the entire process. We send you a questionnaire to identify which states you will be conducting business. A Research Analyst does the research to determine exactly what you need in each jurisdiction. Our Research Analysts are experts in navigating the licensing process and will compile all of the applications for you, provided detailed instructions on how to apply, and provide you with the fees associated with each application in one easy to understand packet. Further, if you do not want to deal with the hassle of submitting applications to multiple jurisdictions LicenseLogix can complete all the applications for you and streamline the process. The pricing for our services vary depending on the extent of services you wish LicenseLogix to perform. For more information on how we can streamline the process of business licensing, you can contact us by clicking live chat function, submitting a question to our licensing team or simply call us at (800) 292-0909.